House MD Episode Guide: Season One #105 "Damned If You Do"
First Season Episodes :: #105 "Damned If You Do"
so click on the "Search Button" above to search for "105". Dr. Gregory House (Hugh Laurie) in the episode "Damned If You Do" which originally aired Tuesday, Dec. 14 (9:00-10:00 PM ET/PT) on FOX. A nun with what looks like stigmata. First off House says it is allergy to dish soap and gives her an antihistamine. She reacts badly and House says she is having an asthma attack for which he gives her a shot of epinephrine and she goes into cardiac arrest. 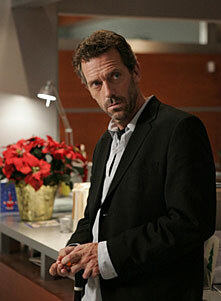 Everyone else thinks House gave her too much, House thinks it is Church-Strauss. Cuddy takes the case away from House. House demands the truth from the Mother Superior. A severe long-term allergic reaction to a copper IUD she had forgotten she had.